As rheumatologists, we often work with our colleagues in dermatology to diagnose and treat autoimmune diseases. Rashes can be seen in many of the diseases we treat including scleroderma, vasculitis, lupus and dermatomyositis. Many physicians and patients are aware of the classic malar (over cheeks and nose) rash seen in systemic lupus erythematosus (SLE or lupus) that can be triggered by exposure to sunlight. Many other rashes, however, can be seen in lupus, including a diffuse circular rash known as subacute cutaneous lupus erythematosus (SCLE) and a scarring rash often seen on the scalp called discoid lupus (see images below). The discoid rash may exist without lupus affecting other parts of the body such as the kidneys and joints. It is often treated by dermatologists with local steroid injections.This rash must be evaluated immediately because, unlike other lupus rashes, it can cause scarring. Medications used for these lupus rashes include topical steroid creams and, if necessary, medicines that help control an overactive immune system that are taken by mouth such as hydroxychloroquine (Plaquenil), quinicrine, and mycophenolate mofetil (Cellcept). 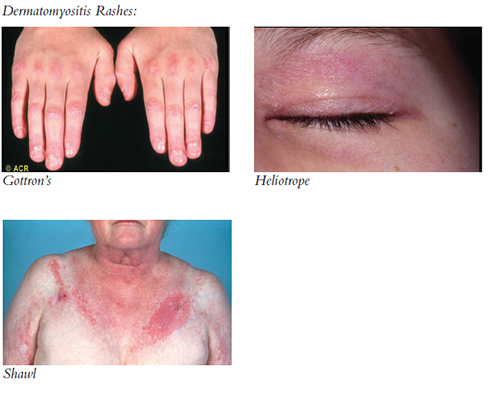 Dermatomyositis is a systemic autoimmune disease that often begins with arm and leg weakness as well as several different rashes including: a rash on the hands (Gottron’s), around the eyes (heliotrope), and/or across the back and chest (shawl rash; see images at right). Diagnosis can be established with a history and exam, a skin and/ or muscle biopsy and lab tests. Dermatologists often help to establish this diagnosis and may do a skin biopsy to exclude other potential causes of these rashes including cancer, allergic reactions to medications, and urticaria (hives). Treatment usually involves steroids taken by mouth and medicines to suppress the immune system such as methotrexate, azathioprine or mycophenolate mofetil (Cellcept). At Arthritis and Rheumatism Associates, PC, we work closely with your dermatologist to manage any rash that may be part of an autoimmune disease.